Roger Federer played some of the finest tennis he has ever played against Rafael Nadal, and he took down to Spaniard 6-3 6-4 in a cold, windy, dramatic match. 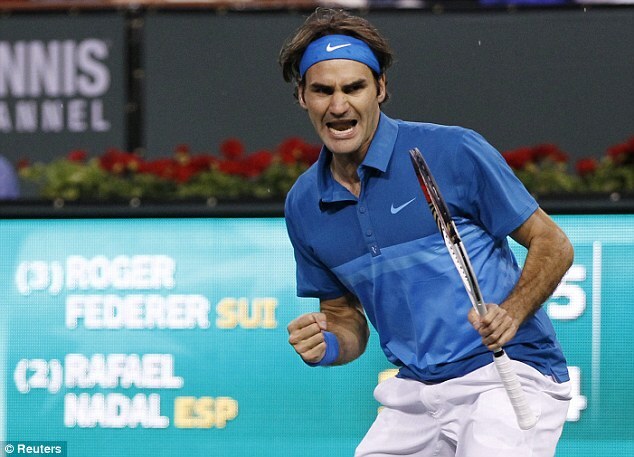 With the win, Federer has now made the final of Indian Wells for the first time since 2006. In the previous semifinal, big American John Isner upset world #1 Novak Djokovic 76(7) 36 76 in an entertaining match filled with all sorts of drama. Federer started his clash with Nadal in the perfect way, getting the early break and going up 3-0. Nadal immediately broke back to get to 3-3, however the tide had not turned. Roger was still playing at a very high level and I knew he was in good standing to still take the set. That turned out to be a prophetic thought because Roger did keep his level high and broke Nadal in the crucial 8th game and went on to take the set 6-3. In the second set, his momentum carried forward. He got the break in the third game and consolidated to go up 3-1. He had a big chance to go up the double break at 3-2 but could not. It made no difference however because he did get the double break to go up 5-2. That insurance break would prove to be very handy as Rafa broke Roger and got back to 5-4. The final game was tightly played as expected, and at 30-30 Nadal missed a forehand into the net after an incredible rally to give Roger match point. The drama did not end there though, as play was halted for a few minutes on MATCH POINT due to some rain falling. I had never seen anything like that happen before. It was nothing to be worried about in the end as when they did start play, Fed smacked an ace out wide to win the match. 63 64 in one hour and thirty one minutes in an absolute masterclass. As fired up as you will ever see Roger. I did not think that Roger could play any better against Nadal than he did at the World Tour Finals last November, but boy, was I proved wrong. The 63 60 demolition was beautiful, but given the tougher playing conditions for Roger in a match against an opponent that clearly has the advantage, this was a level above that. From start to finish, he stuck to the game plan and did not let up for one single second. He came through in the tough moments with flying colours, just like I thought he might with all his success in tough matches lately. Tactically, he was flawless. In the rallies, nearly every forehand was hit cross-court to Nadal's backhand, pushing the Spaniard back and letting the Swiss move in and attack. His backhand was as solid as a rock, and he may have hit it better than I have ever seen him hit it. Considering the slow speed of the courts and usually how effectively Nadal can neutralize his backhand, the way that shot was working was impeccable. He was smacking nearly every backhand cross-court, and with pace and depth. It is the same play that guys like Djokovic employ to beat Nadal, but as we all know, Roger cannot use that play with the same effectiveness, at least outdoors. But tonight was a completely different ball game. Perhaps for the first time ever on an outdoor court, it was not like we were seeing Federer play Nadal, but just another player who Roger knew he was going to beat. He was that confident in his own abilities and I credit that largely to the great form he has had since the Australian Open. One thing is for sure - he learned from his mistakes. Down under, he let up on his strategy and let Nadal dictate play after the first set. He did no such thing this time around, and the best way I can sum it up is in two words: ruthless aggression. And it was amazing. Nadal did seem utterly frustrated with the windy conditions and was not hitting the ball with the same vigor he usually does. However, I also credit that to Roger's supreme attacking, and Rafa was continually pushed back behind the baseline where he could not make any ground. The one thing you cannot do against Fed is let you push him around, but Rafa had no answers, regardless of how many balls he tracked down. There are no excuses this time around, because Roger was playing in the same cold and windy conditions. Roger is just a much better wind player because he can cut through the wind as opposed to Nadal, who's heavy looping balls can be manipulated by the different wind patterns. In my estimation, Rafa's one play wasn't working (forehand to backhand pattern), and he was lost. Regardless of what the tennis media might say, Nadal is still very one-dimensional and this match proved it. When Rafa realized that he couldn't just pepper the Federer backhand because of the strength in which the Swiss was hitting it, what did he do? He kept going to the same play and kept getting burned. When a player has a strong backhand and neutralizes Rafa's usually one surefire strategy, he is done. He can fight as hard as he wants, but he is just incapable of change because he is so one-dimensional. And Federer exploited that brilliantly. In the other semi on the day, played much, much earlier, John Isner defeated Djokovic in three tight sets in a highly competitive and entertaining affair. With the win, Isner not only reaches his first ever Masters 1000 final, but also becomes the first American to take out a World #1 since James Blake at the Beijing Olympics in '08. He also cracks the top 10 for the first time ever, a milestone achievement. Isner was clutch in the big moments and Djokovic did not play very well, and the better and more deserving man won. Djokovic has now failed to defend two of his three titles so far in 2012, and this is a really important time for him. With wins in Miami, Madrid, Rome, and Wimbledon, the next few months will be very important for his quest to keep the #1 spot. Miami is crucial. If he goes out in the semis there, for instance, I don't see any way that he does not lose the #1 by the US Open, be it to Federer or Nadal (which is a battle all its own right now). Overall, Djokovic has not looked good ever since the Australian Open ended. Even then, he barely escaped two tough matches at the end to win that title. I believe he has gotten too defensive from the baseline, and that, coupled with a drop in his returning level, is the reason he is struggling. There is also the previously mentioned point pressure, which must be a huge weight on his shoulders as every tournament becomes that much more important to his future as #1. Federer and Isner have only met 3 times, at the US Open in 2007, at Shanghai in 2010, and of course at the Davis Cup right after the Australian Open, where Isner pulled off the upset. I'm not taking what happened there to mean anything for a few reasons. One, those playing conditions were perfect for Isner; his serves kicked up extraordinarily high, his groundstrokes were always within the strike zone, and the clay court was poor, which did not give any advantages to Roger. Since then, Fed has upped his game considerably and he has good motive to go out there and beat Isner. Also, the way I see it, if Roger can control the baseline against Nadal and move him around, he can certainly do the same to the big American. I expect a straight sets Federer win for title #3 in 2012, titles #19 at Masters 1000 level, and title #73 of his career. Best of luck in the final Roger!